Is Paf a Scam or Legit? Read 2 Reviews! I don’t know folks. The team dug into paf.com this week and came up amused as a result of the entertainment, but at a loss why the word lottery is even included. 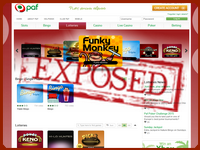 PAF is an online site for people to play slots, bingo, casino, poker, betting and yes, lotteries. Now don’t go there looking for the usual US Powerball or Euro Millions. PAF has its games, and there are only three. PAF stands for “Play among Friends” which is their tag line. Let’s take a look. PAF has three of their own, homegrown lottery games – Power Keno, Hi-Lo Hunter and Pick 3. Click on any of three takes players to a demo and real mode. The games themselves are more like a betting game versus a lottery. Hi-Lo Hunter involves picking whether the next number will be higher or lower with a facility to add ‘jackpot’ which increases the win by €800 on top of your bet. Click on “real” and players have to create an account or log in. Playing at paf.com, players have to deposit a minimum of €10. Keep in mind that this is a site that isn’t set up for lotteries, but more for gambling and betting in general. €10 is also the minimum amount that can be withdrawn from your winnings and in the words of PAF the maximum amount that can be withdrawn “is also affected by the length of our customer relationship with you.” They make two payments a day and your money – your winnings – will be in your bank account between 3 to 7 banking days. There appears to be a bunch of bonuses, but no specific information when they happen or how they happen. What is worse is the few that are described in the terms and conditions all references using a code, but no information on when they kick in or how to get the code. Asking questions is pretty easy; there is an email address and toll-free phone in the UK. There is no live chat, but there is a heap of offices with direct email addresses and phone numbers. Paf.com is registered in the Åland Islands which is an autonomous region of Finland, an island in the Baltic Sea. PAF is publically owned and was established in 1966 to generate money for charities. Initially, they offered gaming on international and local ferries on the Baltic Sea but expanded this to online gaming. Save the Children, and Red Cross are only two of the many charities that benefit. The only problem I have in looking at their 2013 Annual Report, is that less than 3% of their income goes to the charities. Then again, that does mean more for prizes and winnings – I think. Folks, this is a gaming site that has thrown three lotteries into what they offer. Pick 3 picks three numbers and then run the game – there are three levels of payout, and it is not going to put you in the position to run out and buy a Ferrari! Good fun (what the heck) to sit and play, but with a top prize of €800ish depending on what you are betting, definitely not going to challenge the jackpots of US Powerball or Mega Millions. This site gets a thumbs down like a lottery site, and a thumbs up as a place for entertainment. If you have the patience to download the demos, it is fun to sit there and play – and it doesn’t cost anything! I can imagine if you do start winning though, it would be frustrating not to see that bank number roll up! PAF is actually short for Ålands Penningautomatförening, not Play Among Friends (that’s something they made up either when they went online or when they opened a casino). It’s the only legal gambling entity in Åland. And while they have had a few issues with unsavory employees they run a legit business. What a hoot! I can imagine that some people could spend hours in their “try without money” games. The downside is it became very apparent that I shouldn’t be playing Pick 3. I was almost breaking even – just. Their games are definitely not the usual lottery stuff and more like popping in a casino. Stick to the real lotteries!